At the January 1994 meeting of the Islip Town Volunteer Firemen's Association held at the Bayport Fire Department, John "Shorty" Sunderland, a member of the Sayville Fire Department addressed those in attendance and expressed this concern that the rich history of the fire service within the Town of Islip was not being preserved. 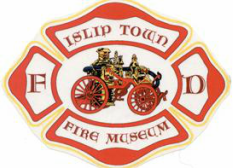 When queried as to a solution to this problem, he suggested the idea of a fire museum be explored to preserve and showcase the valuable history of the departments within the Town of Islip. Shortly thereafter on February 2nd, a meeting was held at Station 2 of the Sayville Fire Department to further explore this rather lofty goal. Those in attendance included John "Shorty" Sunderland, Ex-Captain Bill Johnson, Nick Campson and Charlie Oelkers (Sayville FD), Ex-Chief Ray Reilly (Bayport FD), Ex-Chief Warren Horst (West Sayville FD) and Ex-Chief Rick Gimbl (Holbrook FD). After much discussion, a plan was formulated and the arduous journey began. The task of finding a suitable location to call home proved to be quite challenging. Originally offered space at The Grange, a historical preservation village in Sayville, this opportunity was quelled by an expansion of the local Little League ballfields. The former firehouse of the Central Islip Psychiatric Center Public Safety Dept. was proffered along with the former three story laundry facility, however, both these structures required considerable investment for asbestos mitigation and electrical system upgrades. The use of a hangar at nearby Long Island MacArthur Airport was considered until the Federal Aviation Administration prohibited its' use due to security concerns. The historic Second Avenue firehouse in Bay Shore (which was later converted to the Firehouse Art Gallery, an artist-in-residence gallery) was also considered. Finally, in an attempt to gain some visibility of its' intended mission, a storefront on Dale Drive in Oakdale was rented for $500 a month. Finally, in 2013 the Town of Islip offered a parcel of land across from the Ducks Stadium Ducks baseball stadium in an area comprised of the former Central Islip Psychiatric Center compound that was being redeveloped for community enrichment. with the creation of the Long Island Fire, Rescue and EMS Mega Show, a professional trade show based on Long Island. The first "buff show" as it is known was held in 1994 at Stony Brook University's Sports Center. Twenty fours years later, the Mega Show remains an annual trade show showcasing the latest in fire, rescue and emergency medical apparatus and equipment to first responders throughout the Northeast region while acting as the museum's primary fundraiser for the year. In addition to hosting fundraisers including the Mega Show, the Friends of Islip Town Firefighters (incorporated as a 501c3 non-profit corporation in 2008) sought financial support from the volunteer fire departments and ambulance companies within the Town of Islip as well as philanthropic organizations providing grant funding.